The exhibition was organized by the Danish sculptor Pontus Kjerrman and the art historian Marianne Barbusse. 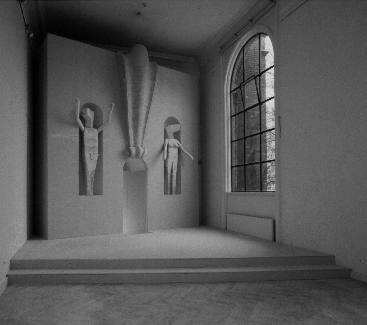 21 sculptors are invited to make an unique "White" installation of paper, plaster etc. in a period of just one week. Kerstin Bergendal, Ole Broager, Henning Christiansen, Vibeke Glarbo, Frans Jacobi, Lone Høyer Hansen, Kirsten Justesen, Clay Ketter, Pontus Kjerrman, Jørgen Carlo Larsen, Christian Lemmerz, Kirsten Lockenwitz, Peter Louis-Jensen, Inge Mahn, Mogens Otto Nielsen, Bjørn Nørgaard, Kirsten Othwed, Jesper Rasmussen, Morten Stræde, Elisabeth Toubro and Richard Winther. The catalogue for the exhibition including photos ( by Bent Ryberg) in situ of all the works costs DKR 125 and can be ordered from:. 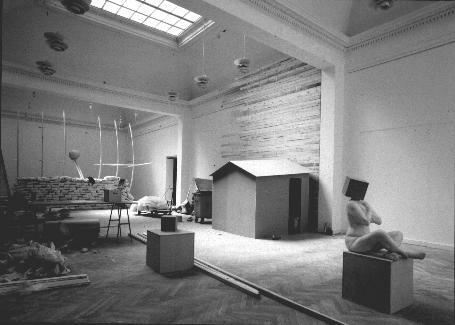 Works in progress by Inge Mahn, Kirsten Justesen and Jørgen Carlo Larsen.